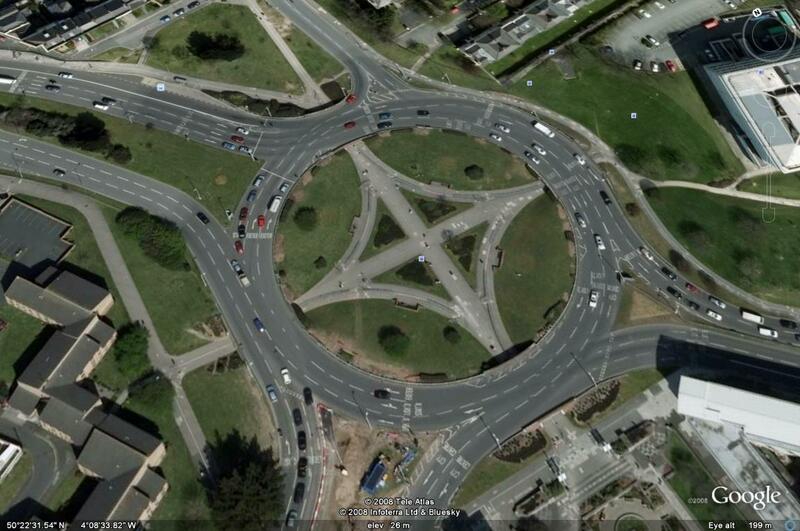 Plymothian Transit: North cross is best site for bus terminus - Discuss! North cross is best site for bus terminus - Discuss! THE bus station at Bretonside should be moved to North Cross roundabout, next to the main Plymouth rail station, says architect David Mackay. The sunken centre of the roundabout could be covered over with a landscaped roof which pedestrians would walk across to reach Armada Way and the city centre, the Barcelona architect said. Mackays idea is certainly one which should be looked at as it is clear he has put some thought into it and it is fairly close to both the City Centre and the Railway Station, although probably not close enough to either to be of much benefit! Space wise it might, with very clever planning be big enough for the main bus stops and possibly National Express services although its hard to see how this could be achieved just looking at this site from above like this. This whole area is pretty much wasted space as it stands at the moment. Personally I dont think this will happen. Plymouth desperately needs a new bus station but I have yet to see a better place for it than the current Bretonside site. Drakes Circus was a missed opportunity in this regard as something imaginative could have been sorted out then, but it wasnt to be. There could be possibilities down around the Colin Campbell Court end of the City Centre which is in need of major development? Im totally unsure if it should move or not! Suppose closer to Railway Station is good, but not as close to Drake Circus. But i suppose buses could go up Charles Street to serve Drake Circus, but in result get delayed on saturdays! Careful planning is needed for this! Plymouth missed the boat on this years ago. A bus/coach interchange should have been built at Marsh Mills along with a proper sized park and ride site, instead of the mini facility at Coypool. Express coaches need not then add to the traffic congestion in the city and could have reduced journey times. As at Reading they would only need to drop off the A38 access the coach station and be gone. High frequency buses would link the coach station with the city centre. This would then enable a smaller rural bus station interchange to be built in the city centre, ideally somewhere near to the railway station. Lets be really radical and knock down a car park, or convert Colin Campbell Court car park forthis. Is Plymouth serious about its publkic transport plan or not? As usual Plymouth is years behind and when and if something is done about the bus station it will unlikely assist with the smooth intergration of public transport in the city. I thsboank you to service making grouping more alive of practical issueExcellent whatsis as exemplary. er to Railway Station is good, but not as close to Drake Circus. to be of much benefit! Space wise it might, with very clever planning be big enough for the main bus stops and possibly National Express services although its hard to see how this could be achieved just looking at this site from above like this. This whole area is pretty much wasted space as it stands at the moment.